DD Form 2024 - also known as the "Dod Security Classification Guide Data Elements" - is a United States Military form issued by the Department of Defense. The form - often incorrectly referred to as the DA form 2024 - was last revised on July 1, 1986. Download an up-to-date fillable PDF version of the DD 2024 below or request a copy through the chain of command. DD FORM 2024, "DOD SECURITY CLASSIFICATION GUIDE DATA ELEMENTS"
state parenthetically that the full title is classified. "Distribution Statements on Technical Documents,"
has been applied to the classification guide. 9) from the list in the current issue of the Index. Index Sequence Number in item 11, e.g., A0123. not appear in the Index). 4. DO NOT INCLUDE CLASSIFIED INFORMATION. 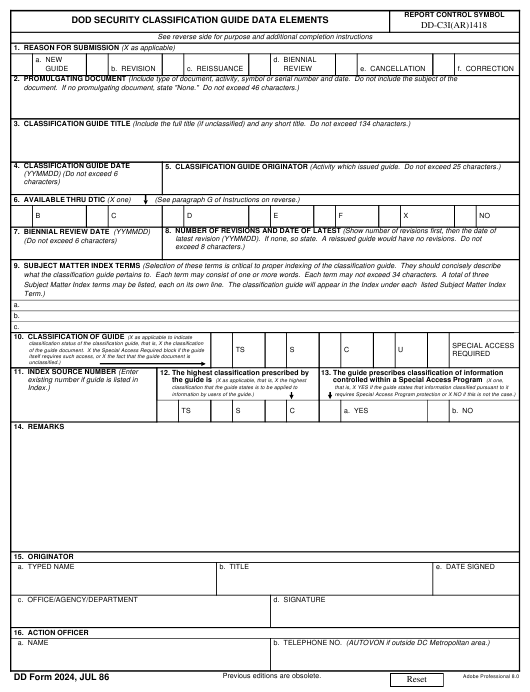 with other items of information on this form. another guide listed in the Index.